In 1978, Jackie Chan had his first box office success as he starred in the film Drunken Master. Countless sequels and rip-offs have sprung out of this film's success and it is considered a Hong Kong cinema classic. The film sees Jackie play the character of Freddy Wong—another incarnation of the classic kung fu legend, Wong Fei-Hung—a young man whose father is an accomplished martial artist, and who has a great understanding of the fighting arts, but lacks the maturity to go along with it. Throughout the opening scenes Freddy gets beaten up by a young lady's chaperone, gets into a fight with one of his martial arts instructors, and roughs up the son of a wealthy local businessman. Freddy lands in hot water with his father and is sent away to practice martial arts with an old vagrant, Beggar So, and this is where the film really gets going. 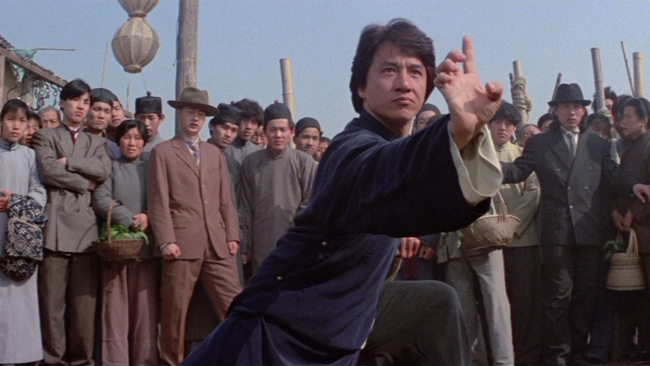 Not only did Drunken Master offer one of the first truly successful examples of martial arts comedy, and introduce zui quan or drunken style kung fu (chuan fa, quan fa, chinese boxing, whatever floats your boat) to the world, it was also a powerful advocate of that public school favorite, the towel whip. When Master So (being played by director Yuen Wo-Ping's father, Yuen Siu-tien) is introduced, and finds himself outnumbered, he immediately breaks out the rag and gets to work. The power that one can achieve with a towel whip is, I'm sure you will know, tremendous. A wet towel? Even more so. I am sure you will remember being scolded by teachers with a tale of that one boy who so famously lost an eye as a result of such horse play... but not famously enough that he had a name or made it into a newspaper. Yes, Douglas Adams was giving sound advice when he instilled the importance of knowing where one's towel is. The advantages of carrying a towel are too numerous to mention. Impromptu swimming sessions, smothering chip pan fires, patting down a lady after a rom-com-esque run-in whilst holding coffee, and the ability to disarm an aggressor with a knife are just a few among them. Knife disarms? Knife disarms. From W. E. Fairbairn to Rex Applegate to the modern era, the only good advice against a knife-wielding adversary has always been pretty much the same. Find something to wrap around your arm, or the knife, and make sure you've been working on your sprinting. If your attacker stays still while you kneel down and wrap it around a few more times. This can mean anything from whipping off your jacket and holding it out as if you're about to net a stray cat, to using cloth to entwine the attacking limb. And if you need that from a more reputable source, Expert Village will back me up. Having some spare cloth around is pretty much the only way you're going to confront a knife and maybe not get your wrists cut to ribbons. Nobody likes the thought of bleeding out on a pavement before they've had chance to wake up and regret the night before. So next time you put on your pink Abercrombie & Fitch t-shirt, which is clearly two sizes too small, remember to take a coat. The extra fabric could save your life. Better yet, layer woolly jumpers. As Drunken Master progresses, Jackie Chan's character works through resentment of his teacher's methods to learn the art itself. The two head into town and Master So feeds his gambling habit. Cheated in a game of ball and cups, the two end up in a fight with Iron Head, a rough customer who predictably has an iron head. Obviously the fight is a comedic one, and Iron Head's reliance solely on his skull as a weapon is not “As Real As It Gets”, but the head can be easily the most damaging weapon in a fight. There's a reason that so many professionals work so hard to sneak head butts in. Evander Holyfield was a masterful boxer, but he was also a filthy cheat in that regard. Holyfield's fights with Mike Tyson are excellent examples. Every time Tyson moved to get in close and rattle of his infamous inside triple, Holyfield would change level (as if he was ducking) and leave his head exactly in front of where he knew Tyson's face was going to be. Notice that Holyfield makes sure that his head is below Tyson's—ensuring that his head connects with Tyson's face. There's a reason the old “nodder”, as Champ Thomas used to call it, is so popular. Deliberately miss a jab, nod your head and step in, you're pretty much guaranteed a collision. Head Butts don't only open cuts, they hurt. Anthony Johnson just recently knocked out Alexander Gustafsson off of a clash of heads. Be it accidental or intentional it clearly shook Gustafsson up. By aid of a hammer, Freddy defeats Iron Head and resumes his studies of kung fu with Master So. Finally So introduces his secret Eight Drunken Gods style. There's been a lot of dispute over just what drunken boxing is and isn't. In truth, there are a few drunken boxing styles, or zui quan as they're known. Here's one variant from the United States. And that is the value of drunken boxing as a philosophy. Not as a complete style, but as a trick play. The swaying footwork and apparent losses of balance are pretty confusing. If you appear to be struggling to keep it in focus, and can let loose one good punch, you stand a good chance of taking your adversary by surprise. The most common time to find yourself in a punch up is out drinking anyway, a bit of swaying might save you the trouble of a fight. If not you can always just explode into a solid punch or two with the element of surprise. Here's an instance of a Drunken Fist stylist in a Kyokushin style rules bout with a karateka. While the man who is more practiced in real sparring—and who is always in position to defend and attack—takes the victory, there is some clear hesitation on his part in the face of the swayings of his opponent. Of course, the great strength of drunken boxing as a trick play or philosophy is as a mask for actual fighting ability. If you have introduced yourself with the notion that you're representing so-and-so's school of Drunken Fist Kung Fu, you've just emptied all of your rounds into the air to announce your arrival. Good going. You will notice though that when the karateka is landing glancing high kicks, he is reluctant to follow up at first. That drunken stepping pattern disguises the instances of genuine balance loss. The karateka doesn't know if he's hurt his man or if it's some kind of trick. Really the value of feigning intoxication is the same as feigning fatigue or injury. Eddie Bravo often recounts that he'd make gargling sounds in his grappling matches as if whatever his opponent was doing was close to yielding a tap out. After they'd burned their arms out attempting to force the tap, Bravo would pop his head out and get to work. And Emanuel Augustus, who might have the only style of fighting in combat sports which I cannot hope to effectively put to paper, made a great career out of what could be called a form of drunken boxing. Floyd Mayweather famously rated Augustus as the toughest opponent he ever had to prepare for. Unpredictability will always be a terrific advantage in a fight, and when the opponent becomes jumpy and ready for anything, all the basic stuff starts connecting easily again. In the final fight of Drunken Master, Freddy uses all seven of the Eight Drunken Immortals techniques that he has learned to battle against Thunderfoot. The absent method is that of 'Miss Ho', the sole female among the Eight Immortals. Freddy refused to learn it initially because it was too feminine, but finally comes to embrace it in the film's finale. In the Chinese martial arts—and it is always dangerous to make generalizations about such an enormous number of styles—techniques that see a turning away from the opponent are often considered feminine. In Eight Drunken Immortals, the style of Miss Ho (or He Xiangu as she is traditionally called) is characterized by “brushing of the hair” movements and “rolling of the hips”. That means lots of back turning and lots of elbows. Of course, showing your back in a fight is a fairly dangerous business. You're asking to be smacked in the back of the head or the kidney. In most combat sports, turning of the back is ruled a foul or worse, considered timidity, which is enough to merit a disqualification. That being said, against a truly superb technician, sometimes you need a touch of the weird. Against Joe Louis, who many consider the perfect technical boxer and the greatest heavyweight of all time, Jersey Joe Walcott found success by dancing from stance to stance. At one point, Walcott crossed his legs (a no-no) and walked away from Louis with much of his back on show (a bigger no-no). Louis ran in to attack, but the distance Walcott had created gave him plenty of time to reset his feet, lean back, and crack Louis with a counter that threw the champion to the mat. Drunken Master did what all of Chan's movies up to that point could not, they made him a star. Off of this film Chan was given opportunities to star in numerous films and to choreograph his own fight scenes—resulting in some of the funniest scraps on film. The film is as silly as they come, but sometimes fighting is too.